BACKGROUND AND PURPOSE: Vertebroplasty performed in the mid- and upper thoracic spine presents technical challenges that differ from those in the lower thoracic and lumbar region. We herein report results of percutaneous vertebroplasty for treatment of painful, osteoporotic compression fractures in the mid- and upper thoracic spine. METHODS: Retrospective chart review identified vertebroplasty treatments performed for painful osteoporotic compression fractures at T4-T8. The following were catalogued: percentage of vertebral body compression, needle size, surgical approach, clinical outcome, volume of cement injected, and complications. RESULTS: Sixty-three vertebral bodies were treated in 41 patients. Mean percentage of compression was 44%. Bipediculate injections were used in 12 (19%) of 63 treatment levels, and unipediculate injections were used in 51 (81%) of treatments (75 injections performed). Eleven-gauge needles were used for 55 (73%) of the 75 injections, and 13-gauge needles were used for 20 (27%). Clinical follow-up was available for 76% of the patients. Mean pre- and postoperative pain intensity was 9.7 ± 1.0 and 1.7 ± 1.9, respectively (P < .0001). Mean pre- and postoperative medication scores were 3.4 ± 0.7 and 1.7 ± 1.7, respectively (P = .075). 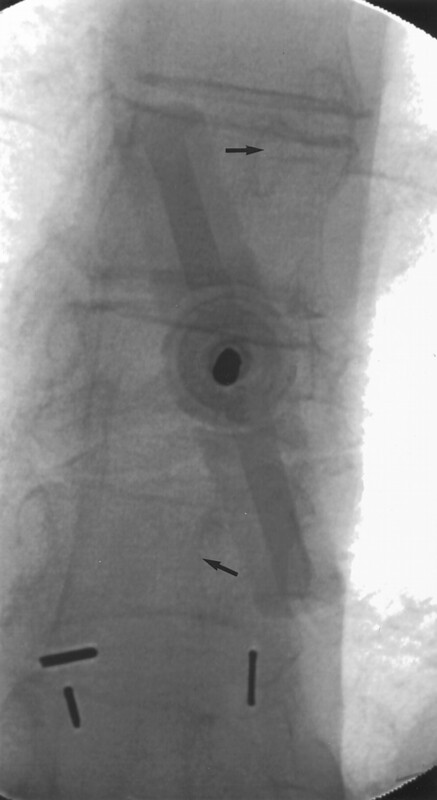 Fracture involving the pedicle used for needle access was noted in one (1.3%) of 75 injections; this pedicle had been traversed using a 13-gauge needle. Staphylococcus epidermidis infection occurred in one case. No cases of pneumothorax were noted. 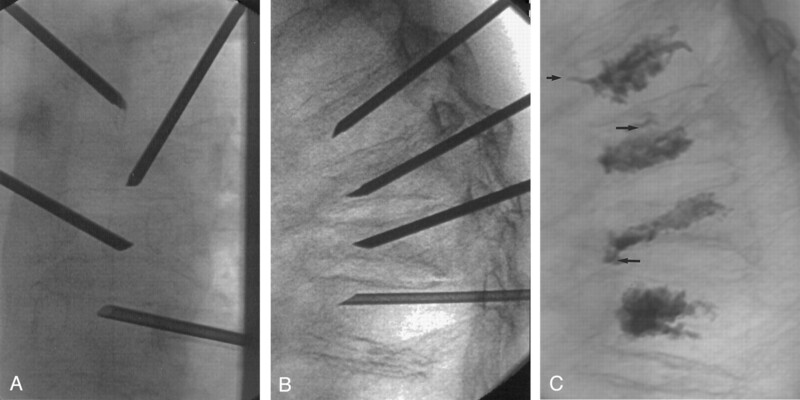 CONCLUSION: Transpedicular vertebroplasty is readily and safely performed using 11-gauge needles in the mid- and upper thoracic regions, yielding excellent pain relief and low complication rates. Percutaneous vertebroplasty has become an established technique for treatment of painful, osteoporotic compression fractures (1–8). Transpedicular vertebroplasty can be performed with a very low complication rate and excellent clinical outcome. During the first several years of our clinical experience, most treated levels were in the lower thoracic spine and in the lumbar spine. During the past 2 years, we have noticed a marked increase in the number of mid- and upper thoracic vertebral bodies referred to us for percutaneous vertebroplasty. We surmise that continued referral to our tertiary care center suggests that some practitioners remain reluctant to approach upper thoracic vertebral compression fractures with percutaneous vertebroplasty. The perceived technical difficulty of upper thoracic vertebroplasty as compared with lumbar vertebroplasty may relate to the relatively small size of pedicles in the thoracic region, frequent severe angle of approach secondary to thoracic kyphosis, and risk for pneumothorax. We herein report our experience with percutaneous vertebroplasty for treatment of painful, osteoporotic compression fractures in the mid- and upper thoracic spine. A retrospective chart review was conducted at our institution to identify vertebroplasty treatments performed for painful osteoporotic compression fractures at thoracic vertebral levels T4-T8. The following features were catalogued: percentage of vertebral body compression, needle size (11-gauge versus 13-gauge), approach (uni- or bipediculate), clinical outcome, volume of cement injected, and complications. Patients were treated under conscious sedation. Biplane fluoroscopy was used in all cases. The craniocaudal needle angulation was determined using the lateral tube. Once the craniocaudal angulation of the needle was determined, the anteroposterior tube was used to identify the pedicle in the medial-lateral direction. The anteroposterior tube was angled craniocaudally until it aligned along the needle projection that had been initially determined using the lateral tube. To facilitate placement of the needle tip near the midline so that a single injection could be used to fill both portions of the vertebral body, the anteroposterior tube typically was angled approximately 20 degrees lateral to the vertebral body (Fig 1). This angulation of the tube projects the ipsilateral pedicle approximately 25% medial to the lateral edge of the vertebral body. The needle was advanced until its tip rested in the anterior third of the vertebral body (Fig 2). Oblique anteroposterior view during needle placement. The anteroposterior tube is aligned parallel to the axis of the needle. The hub of the needle obscures the pedicle at the treatment level; however, its position can be estimated by viewing the ipsilateral pedicles at levels immediately above and below (arrows). Note that the angulation of the anteroposterior tube projects into the ipsilateral pedicles approximately 25% medial to the lateral edge of the vertebral body. Images obtained in a 70-year-old patient with compression fractures at T5-T8. All fractures showed increased uptake on bone scans (not shown). A, Anteroposterior view of final needle position at T5-T8. Needles at adjacent levels are staggered with respect to side of approach. The tips of the needles are at or slightly across midline. B, Lateral view of final needle position, with needle tips in the anterior third of the vertebral bodies. C, Lateral view after cement injection. The cement extends to approximately the posterior 25% of the vertebral body. Note small amounts of venous (short arrow) and end plate (long arrows) cement extravasation. Cement was prepared as previously described (8). Briefly, cement was prepared by combining polymethylmethacrylate powder with sterile barium sulfate for opacification and tobramycin powder for infection control. Liquid monomer was then added to make a thin “cake glaze” consistency. Cement injection was considered complete when the cement reached the posterior fourth of the vertebral body on the lateral projection. Injection was also terminated when epidural, venous, or trans-end plate extravasation was noted. After needle removal, patients underwent strict bed rest for 1 hour and were then discharged home. Preoperative assessment was conducted in a clinic consultation before the day of the procedure or on the day of the procedure. Follow-up was performed by telephone interview by the same assessor (P.A.S.) who conducted the preoperative assessment. Pre- and postoperative assessments were conducted for the following clinical parameters: 1) pain severity, using an 11-point scale (0 = no pain, 10 = most severe pain); 2) analgesic requirement, using a six-point scale (0 = no analgesic use, 5 = parenteral narcotics administration), and 3) mobility, using a five-point scale (0 = full activity, 4 = bedridden). These scales were developed in our department for administration to our patients who underwent vertebroplasty, and they have not been formally validated (7). Pre- and postoperative scores for pain severity, analgesic requirement, and mobility were compared using the paired t test. Sixty-three vertebral bodies between T4 and T8 were treated in 41 patients: T4 (n = 2), T5 (n = 6), T6 (n = 16), T7 (n = 21), and T8 (n = 18). The mean percentage of compression was 44% (range, 15–70%). Bipediculate injections were used in 12 (19%) of 63 treatment levels, and unipediculate injections were used in 51 (81%) of the treatments; a total of 75 injections were performed in these 63 levels. Bipediculate injections were used at T6 (n = 1), T7 (n = 4), and T8 (n = 7). Eleven-gauge needles were used for 55 (73%) of these 75 injections, and 13-gauge needles were used for 20 (27%) of the injections. Levels treated with 13-gauge needles included T4 (n = 1), T5 (n = 2), T6 (n = 6), T7 (n = 7), and T8 (n = 4). For all levels, the mean volume of cement injected was 3.2 ± 2.0 cm3. The mean volume of cement injected at T4-T6 was less than that at T7-T8 (2.4 ± 1.5 versus 3.6 ± 2.1 cm3, respectively [P = .01]). No correlation existed between volume of cement injected and percentage of compression; mean cement volume for fractures of less than 50% compression was 3.1 ± 1.3 cm3, as compared with 3.1 ± 2.6 cm3 mean cement volumes for fractures of greater than 50% compression (P = .89). Clinical follow-up was available for 31 (76%) of 41 patients at a mean of 28 days (range, 1–90 days). Mean pre- and postoperative pain intensity was 9.7 ± 1.0 and 1.7 ± 1.9, respectively (P < .0001). Mean pre- and postoperative medication scores were 3.4 ± 0.7 and 1.7 ± 1.7, respectively (P = .075). Mean pre- and postoperative mobility scores were 1.5 ± 1.5 and 0.4 ± 0.5, respectively (P = .17). Postoperative fracture involving the pedicle used for needle access was noted in one (1.3%) of 75 injections; this pedicle had been traversed with a 13-gauge needle. Postoperative Staphylococcus epidermidis infection occurred in one case. This patient was severely immunocompromised as a result of steroid therapy. No cases of pneumothorax were noted. Percutaneous vertebroplasty has gained widespread acceptance as a useful therapy for painful, osteoporotic compression fractures. Previous studies have described the vertebroplasty technique (7), patient workup, and outcomes (1, 2). Most reported cases of vertebroplasty have occurred in the lower thoracic spine and in the lumbar spine. Mid- and upper thoracic vertebroplasty may pose special challenges, considering the relatively small pedicle size, risk of pneumothorax, and severe angulation from kyphosis that are not present in lower thoracic and lumbar procedures. This series of 63 vertebral bodies treated in 41 patients confirms the ease and safety of percutaneous vertebroplasty in the mid- and upper thoracic regions. Vertebroplasty achieved outstanding relief of pain in this cohort; a strong trend toward decreased medication use was also noted. Although needle placement was challenging in cases of severe thoracic kyphosis, strict adherence to basic principles of craniocaudal angulation with the lateral tube and slight obliquity to the anteroposterior tube facilitated rapid treatments in every case. The complication rate was extremely low, with only one case of iatrogenic pedicle fracture and one case of iatrogenic infection. No cases of pneumothorax occurred. This series confirms the safety and effectiveness of mid- and upper thoracic percutaneous vertebroplasty. Although we used biplane fluoroscopy in this study, we do not suggest that biplane fluoroscopy is essential to perform safe, thoracic vertebroplasty. When using single plane fluoroscopy, the basic premise of identifying the appropriate craniocaudal trajectory and skin entrance site and then monitoring of needle advancement anteroposteriorly can be readily applied. Biplane fluoroscopy speeds the procedure but is not considered essential. The relative number of upper thoracic vertebroplasties performed in this series is small, with most cases having been performed in the midthoracic region. We have rarely, if ever, been referred patients for vertebroplasty at T1-T3, so we are unable to report data relevant to that area. Most fractures related to osteoporosis are located in the midthoracic (T7-T8), thoracolumbar (T11-T12), and lumbar regions (9, 10). The distribution of fractures treated in our series is compatible with the known distribution of osteoporotic fractures in the thoracic spine; as such, this series may be helpful to practitioners of vertebroplasty. The clinical results in this series are similar to those of numerous previous case series of percutaneous vertebroplasty (1–8). Previous studies did not focus specifically on mid- and upper thoracic compression fractures. Our data suggest that the excellent results achieved with lower thoracic and lumbar vertebroplasty can also be achieved in the upper thoracic region. Complications were extremely rare in our series. The single case of pedicle fracture occurred when using the 13-gauge needle. We noted no case of pedicle fracture when using the larger 11-gauge needle. We prefer the larger needle, because it is substantially easier to position than is the thinner 13-gauge needle. The single case of iatrogenic infection occurred in a patient who was severely immunocompromised from high dose steroids. We used tobramycin within our cement and also added IV administered antibiotics. We do not think this case of infection was caused by the thoracic location of the fracture; it was more likely secondary to the patient’s severely immunocompromised state. Transpedicular vertebroplasty is readily performed in the mid- and upper thoracic region, yielding excellent pain relief and low complication rates. A unipediculate approach can be used in most cases. The use of smaller diameter needles is not indicated, because mid- and upper thoracic vertebroplasty is safely performed using 11-gauge needles. Jensen ME, Evans AJ, Mathis JM, Kallmes DF, Cloft HJ, Dion JE. Percutaneous polymethylmethacrylate vertebroplasty in the treatment of osteoporotic vertebral body compression fractures: technical aspects. AJNR Am J Neuroradiol 1997;18:1897–1904. Accepted after revision March 11, 2002.